Burns Lake lays at the bottom of the Bulkley Basin next to the largest Provincial Park in British Columbia - Tweedsmuir Park and the smallest - Deadman's Island Provincial Park, an island of only one-hectare actually located in Burns Lake. The massive wilderness at the doorsteps of Burn Lake gives fly-in, fly-out access and tours for sightseeing, hunting, and fishing. 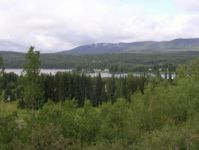 Many of the lakes in the surrounding region are stocked with char and rainbow trout. There are no facilities at this park and also no user fees.